Your Carnival Cruise is just a few clicks away! Cruise Now and Pay Later on Carnival - The World’s Most Popular Cruise Line® with 26 ships departing from 18 different home ports and operating 3 to 16-day voyages to The Bahamas, Caribbean, Mexican Riviera, Alaska, Hawaii, Canada, New England, Bermuda, Australia, New Zealand and the Pacific Islands. Their newest ship, Carnival Horizon, debuted in 2018, while Carnival Panorama is scheduled to enter service at the end of 2019. 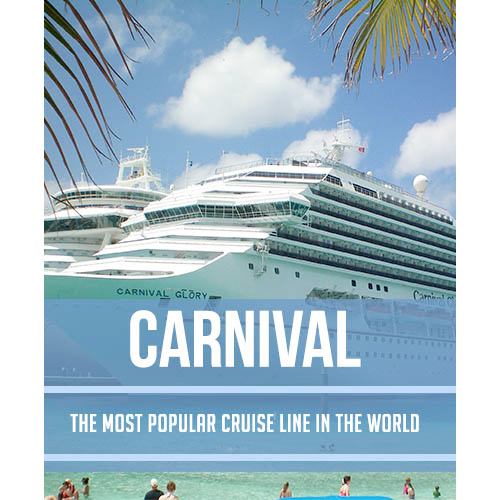 Carnival offers a wide array of quality cruises and pride themselves on delivering memorable vacations to their guests. A Carnival cruise offers not only outstanding value for the money, but most importantly, fun! A “Fun Ship” cruise features day and nighttime entertainment -- stage shows, musical performances, casinos and more. They make their guests feel right at home, too — think comfy stateroom accommodations, attentive service, delicious food and drink — and they enjoy the experience against the backdrop of some of the world’s most beautiful ports. Our cruise now pay later on Carnival Cruise lines includes 12 months interest free financing and low payments. Please fill out the Cruise Request Form below to get a price on your Carnival cruise or give us a call at 1-800-358-2883. You must have already applied for credit in order to get a price quote.